A win for local mothers and expectant mothers this week with upgrades confirmed to facilities around Karratha City Shopping Centre. There are new NO SMOKING signs around the entrances of the shopping centre and in particular, around the main parents room located near Centre Management. "The lavatories and parents room are due for upgrades in the new financial year" says Melanie Garbin, Manager of the Vicinity owned mall. Soon to start, the parents and prams bays as well as the seniors car parking bays will also be widened in the new financial year. Iron Ore price at highest level in almost a year. The iron ore price last night soared to its highest level in almost a year. This in turn has restored confidence in China’s economic growth and provides a much-needed charge for WA’s crenelated mining industry. The spot price was up just under $US10 to $US63.74 a tonne. A 19 per cent rise described by Metal Bulletin as the biggest since it began tracking the daily value of the steel commodity seven years ago. This desired recovery had been anticipated earlier yesterday when iron ore futures in Asia soared, followed by the share prices of WA’s miners. Please refer to the below image, to note current Rio Tinto Access road closures in and around the Pilbara region. This is due to heavy rains and flooding in some area's. Exercise caution when travelling this Wet Season. A small team of community minded people have banded together to rally donations for those who have lost everything in Yarloop and Waroona from the Southwest bushfires. "The blaze, which started on Wednesday, destroyed 131 homes and other structures in the historic mill town of Yarloop, and DFES said that number would no doubt continue to rise. The fire has so far burnt through 70,000 hectares of land and its perimeter stretches for more than 222 kilometres." Source: ABC News. Karratha City Councillor Marg Bertling, Vicinity Karratha City Shopping Centre Manager Melanie Garbin and Everything Karratha volunteer Hailee Harvey have organised a local drive, taking donations for sorting in one of the empty retail spaces at Karratha City Shopping Centre from noon today and will continue to do so through the next week or so. Everything Karratha is in contact with the main donation point for those affected in the South West, to ensure what is being donated suits their needs, as other donations have been coming through thick and thin from other sources all over the state. "Karratha friend's, here's the start of our community appeal. This is a very humbling experience to say the least." Mel Garbin, Shopping Centre Manager. "We are calling out for volunteers who can assist from Monday the 11th of January to sort donations. Please drop into the collection point opposite Nickol Bay Jewellers". Donations of clothing, all ages and sizes, shoes, kitchenware, linen, toiletries and infant wear are welcome. If the site has been closed for whatever reason, please donate in the collection cages in front of the designated retail space, clearly labelled for easy co-ordination. Thank you to Mint Removals, Tradelink, Marg Bertling, Melanie Garbin, Federation Shopping Centre, Hailee Harvey and the many individual donators thus far. A warning to all Hearson Cove adventurers this holiday season. This morning a little girl, aged 5, was stung possibly by an Irukandgi jelly fish. Symptoms were excruciating pain, red markings where possible stinging occurred and instant vomiting. The girl is currently under watch and recovering in hospital. "The Department of Fisheries is investigating the deaths of thousands of baitfish which washed up on the Pilbara coast late yesterday. A member of the public reported the dead fish after finding them washed up on a beach near Wickham Dog Beach, about 50km east of Karratha." Do you have any photographs of Roebourne? Next year will mark 150 years for the town of Roebourne. Alot of celebrations, both big and small are already being planned. 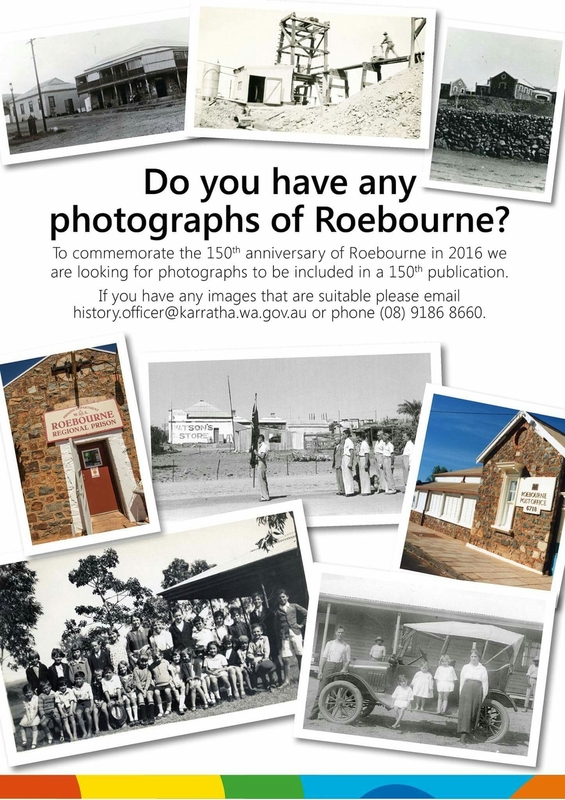 To commemorate the 150th anniversary of Roebourne in 2016, The City of Karratha are looking for photographs to be included in a special publication. Images of community events and news, weather, family life, businesses or scenes that capture the uniqueness of the town and its people are needed. Historians are completing a lengthy timeline, displaying photos of the town and other interesting moments of Roebourne's 150 years and need our help. Although they are chasing photos from any year, the team do have quite a few photos already from certain year blocks. The City of Karratha are interested in photographs, in particular from 1960 onwards, where they have gaps in the compiling timeline. If you have any images that are suitable please email history.officer@karratha.wa.gov.au or phone 08 9186 8660. Joel Jackson; Still the boy next door. From local K-town muso to tinsel town's 'Best Leading Actor', Joel Jackson is Australia's new Golden Boy! The budding actor (and ex Karratha local) has just taken out the AACTA Award for Best Lead Actor in a Television Drama. Jackson, 24, was the male lead in Channel 7's Peter Allen series, alongside industry legends Sigrid Thornton and Rebecca Gibney. His performance of the late Australian performet in Peter Allen: Not Just the Boy Next Door has him pegged as Australia's next big thing. SAFE are currently running a GoFundMe Campaign to help pay for the surgery of a young cat that has severe injuries due to its collar never being adjusted as it grew. If you wish to donate to help this poor animal then please follow the link below. The green light has finally been given for the proposed Karratha Arts and Community Precinct, after $10 million of funding for the construction of the project was approved earlier today in second round offers. In June, the City of Karratha narrowly missed out on the first round of the Federal Government initiative funding, which was planned to supplement the construction of the City's first significant cultural art's hub. The $54 million project is set to bring some long-awaited facilities, to support cultural and artistic growth in the region. The centre will not only support current community groups in their artistic adventures, but will provide a workeable space to establish a local recognition of cultural talents across many different disciplines in Karratha. The proposed precinct boasts a magnificent arts centre and gallery space, an outdoor event space complete with amphitheatre and concert space/stageing, as well as a new library and space for the local history office. Sharpe Avenue, in the heart of town is set to revive the Christmas Spirit once again this year with the City of Karratha's newly devised annual lights display. Last year was the first year in which the City of Karratha attempted such cheer and it was a huge hit. This year the light display will return to the City Centre bigger and better than last year. Santa will also be making a rare appearance at tonights event to give the Mayor a hand turning on the Christmas lights. Pop down and say hello from 6:30pm, give Santa your Christmas list and see the street light up! Sharpe Avenue street event last year.